A replenishment item for every First Aid box, opt for our Triangular Bandage today. This versatile and unhemmed dressing has a calico triangular design that is perfect for supporting shoulders, arms, writs and hands. It can be folded into a sling for injured limbs or used to immobilise or secure other dressings into place. They are a reusable and washable option that works without your current budget and can be used by people of most skill levels. 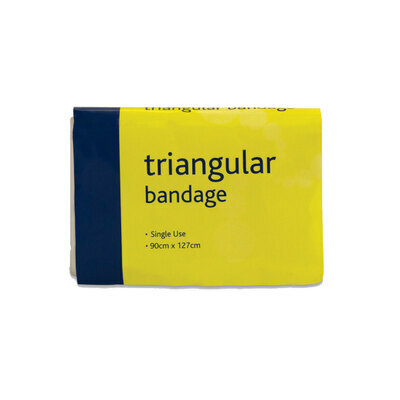 Simply place this triangular bandage alongside the other medical essentials in your store to ensure you're ready for any potential accident or injury. We have a wide range of First Aid & Medical Supplies available online today. From our Tuff Cut Scissors through to Elastic Adhesive Bandages and Washproof Tape, you'll find everything you need to stay on top of potential accidents.